Anker PowerCore 20100 High-speed-charging, long-lasting, portable power. From ANKER, America's Leading USB Charging Brand • Faster and safer charging with our advanced technology • 20 million+ happy users and counting Ultra-High Capacity Enough power to keep you going for days. Charge an iPhone 8 almost seven times, a Galaxy S8 five times or an iPad mini twice. High-speed Charging Technology Exclusive to Anker, PowerIQ and VoltageBoost combine to ensure your devices charge at their their fastest possible charge speed. Does not support Qualcomm Quick Charge. 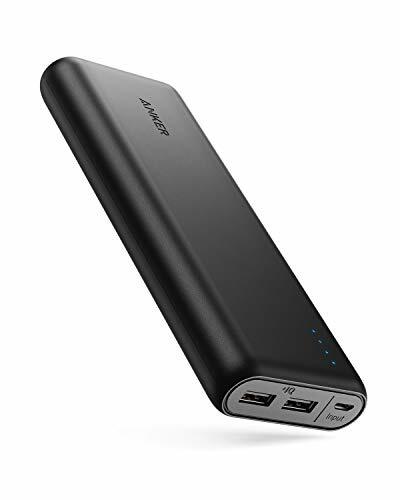 Enormous 4.8A Output Industry leading output of 4.8 amps provides enough power to simultaneously charge any combination of devices at full speed. MultiProtect Safety System Surge protection, short circuit protection and more advanced safety features keep you and your devices safe. Matte Finish Enhances grip and doesn't leave smudges or fingerprints. World Famous Warranty At Anker, we believe in our products. That's why we back them all with an 18-month warranty and provide friendly, easy-to-reach support. What's In the Box PowerCore 20100 Portable Charger Micro USB cable Travel Pouch Welcome Guide For Optimal Use: • Use the included cable, your original cable or a third-party certified one (such as MFi). • Compatible with 12'' 2015 MacBook (USB-C cable required), iPhone XS / XS Max / XR, Android smartphones and tables (including the Nexus 7), and other USB-charged devices except for the iPod nano, iPod Classic, HP TouchPad, Dell Venue 11 Pro, Asus tablets, and some GPS and Bluetooth devices.